Born in Truro, Cornwall, to an Irish immigrant father and Cornish mother, Mackennal move with his family to London in 1848 and continued his education in the school of William Pinches near Lombard Street, where a fellow pupil was Sir Henry Irving, the actor. In 1851 he went to Glasgow University where he was active in Liberal politics and in the University’s famous Dialectic (= debating) Society, but left without graduating in 1854, to train for the Congregationalist ministry at Hackney College. He completed his course there together and at the same time graduating with a BA from University College London in 1857. 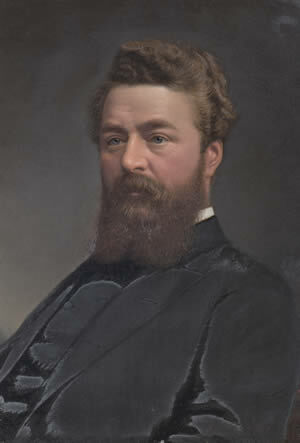 His first Ministry was at Burton-on-Trent, Staffordshire, from 1858-61, followed by nine years at Surbiton, Surrey, initially holding his services in a large hall but during the period a church was built to his design, and he also contributed to an influential volume edited by Dean Stanley Addresses to Working People in 1867. In 1870 he was invited to Leicester to serve as Minister to the leading Congregationalist church and community in the town, the Gallowtree Church (long since demolished), in succession to Rev. James Allanson Picton (1832 – 1910, and the Lit. and Phil. President in 1868-1869). During his seven years in Leicester in addition to his church duties he was very active in the work of the Leicester and Rutland Congregational Union as its Secretary, the Lit. and Phil., and educational politics in the town, though he refused to serve on the School Board because of he disagreed with aspects of the 1870 Act. In 1877 Mackennal became Pastor of the Congregational Church in the wealthy Manchester suburb of Bowdon Downs, receiving the then substantial stipend of £1000 a year, which among other things enabled him to sends his sons to Rugby School, and he remained at Bowdon Downs for the rest of his life. He became a leading figure nationally and internationally in Congregationalism, for example supporting Mansfield College Oxford nd becoming its Chairman in 1891, took a leading role in organising the International Congregational Council and its first meeting in 1892 in Manchester, the first Free Church Congress in 1892, also in Manchester, and he was President of National Council of the Evangelical Free Churches for 1899-1900. However, his last years were hit by controversy and disillusionment because of his pacifist views at a time when the country was at war, particularly in South Africa, calling for unilateral disarmament by Britain as an example to other states, and for an end to the War, a general amnesty and the granting of self-rule to the Boer provinces. However, during this period he wrote and published a history of English Congregationalism Sketches in the evolution of English Congregationalists (1901) Mackennal died in Hampstead and was buried back in Bowdon Downs: his death was widely reported around the English-speaking world: there was even a short obituary in one of the leading Australian newspapers. Sources: MacKennal, Alexander (1835-1904) Oxford Dictionary of National Biography (2004); Mackennal, Rev. Alexander Who was Who 1920 – 2008 (Online edition Oxford University Press 2010).